And those 3 things are far from independent! It’s a progressional relationship. 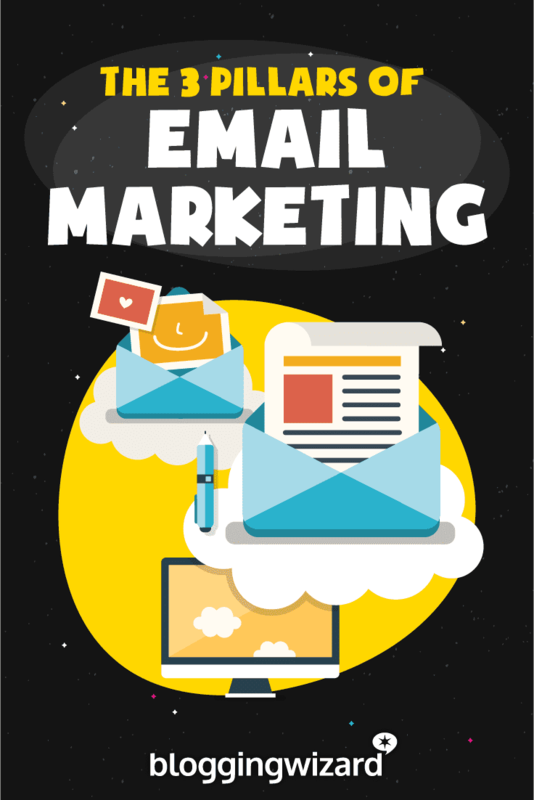 From this very important relationship, we draw the 3 Pillars of Email Marketing. The last time you signed up to someone’s email list, it was probably because you needed a lead magnet they were offering right? You probably also downloaded 3 other lead magnets on the same topic from 3 different blogs around the same time! That’s the exact process your new subscriber goes through too. They don’t really know who you are and probably don’t even care, yet. The problem with this is that people only open emails from people they know, so if you don’t introduce yourself and give them a reason to open your next email you may even get reported as spam! This is probably the most important key to increasing your open rates. The first email typically (should be) bears the freebie they signed up for, so chances are already sky high that they will open it. In fact, the first email in a welcome series is reported to have an open rate of 84.22% on average! Over 70% of people actually expect you to email them the minute they subscribe to your list, so this is your perfect opportunity to oblige and give them a reason to open again. Remind them of who you are. Give them a reason to connect with you, trust and like you. Use social proof to spark some fear of missing out in them. And let them know what to expect from you, what’s in it for them! Those are the key elements your first email should have. I show what to expect from opening my emails. I include a script to copy paste for an introduction which is actually me surveying them and effectively whitelisting my email address with them when they reply! At least 15% reply. I add a call to action to actually open the freebie they downloaded, only when they use it will they know the value. Don’t have an engaging welcome email setup yet? 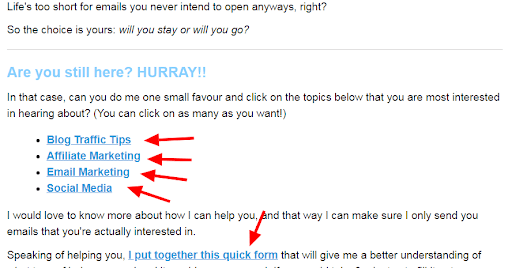 Here’s my easy 3 step formula to help you write your first welcome email yourself. Celebrate them joining your list and get them excited about their decision to join and the change they are about to experience. You want to show them a specific and desirable end. Who are you? Why should they listen? Do you have a unique story that shows how you went from them (confused/ineffective…) to you (focused/super effective…)? Use that story succinctly. Now that you have their attention, get them to do something to engage with you. Once someone engages with you it becomes easier to get them to open your emails. Ask them to follow you on social, point them to your best content and my favorite, ask a powerful question that gets them to reply. The last thing you want to do is show up in your subscriber’s inbox with a name or email address that leaves them wondering who you are. That’s just super recipe for being marked as spam. Set up your name or brand name to show as the from address. I like to use the format below for the first email, then send subsequent emails with my full name only. As for brand emails, a lot of people don’t think it really matters but even when you are automating email marketing and people already know it, something as simple as using your own name for your email address i.e lily@findingbalance .mom as opposed to ‘admin’ or ‘team’ or ‘support’ makes a huge difference. Your list is an extension of your blog and you do not want to create a disconnect from blog to list with your tone or personality. Does your blog employ the formal writing voice? Stick to it in emails too. People form an impression of you and your brand from what they read and see, and if it doesn’t match all around it’s time to sit down and truly reassess your brand. This is where things start to get really interesting. Did you know that the content of your email carries more weight than your headline? Especially when people are new to your list and just giving you a chance. It’s like meeting a new friend, if she’s nice (shares quality content, genuine, relatable) you want to play, if not (salesy, full of fluff, annoying) the next time you see her you run away. Nail this and you’ll have subscribers that open your every email regardless of your headline. Screw it up and not even a headline written by Zeus himself will make people open next time! Simply put, your welcome series should lead your subscriber through a unique transformation that makes them remember and trust you. Don’t have one yet? Create your first welcome series today! Here’s a simple guideline. Email #2 – A Surprising Fact that will Make them think (Begins a story). Email #3 – How to Overcome The Problem you Agitated in your previous email. What you are basically doing is using a system I call the “Close-Open Loop”. You provide a solution to a problem you previously agitated and introduce a new problem just at the end of your email so that they expect a solution in the next email and open it. It’s why I strongly favor planned rather than random emails (even for general newsletters), more on that later. How many emails should I send? How long should I space them out? Depending on what you want your new subscriber to do, your welcome email series can be as short as 3 emails or as long as 52! Maybe even more if you email daily. Most welcome email series are usually 5 – 7 emails long and are spaced out at 3 days on average. Remember, you are taking your subscriber on a journey. What would they need at every stage of their journey? Does this content interest everyone on my list or just one segment? How does sending this help my business? What action do I want my subscriber to take upon receiving this email? What is the natural next step for them? I like to have my emails planned, written and put on autopilot for the subscriber’s first 6 months at least using the “Close-Open Loop” as stated earlier. Chances are you’ve been grossly missing out on the potential of personalization. Or worse, misusing it. How do you personalize your emails and boost your open rates? Speak to only one person. Group subscribers by interests, age, or/and knowledge and send relevant content. But how do you find out those things you say? Ask and use automated click triggers to group them. Most email clients make it easy to tag subscribers based on their actions. 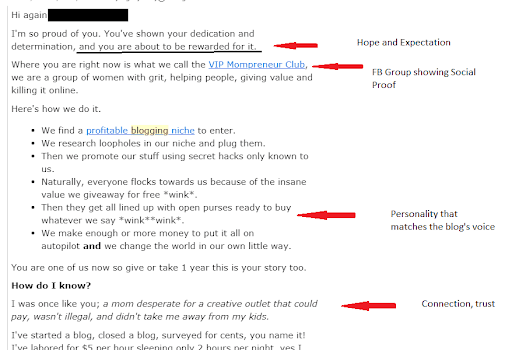 This email from Ana Savuica automatically segments a reader with one click. Then there’s a survey form too! Who is signing up for what? A ‘How To Design A High Converting Pin Image’ free course on the other hand would attract subscribers with a main pain point, the need for more Pinterest traffic. You can then use that info to tailor content to them so the pin templates subscriber gets content that teaches them how to design graphics quickly and beautifully, while the free course subscriber gets content on graphic design hierarchy, using call to actions on pins. One of the ways to find out who is signing up for what (something you should do before you even create your opt-in) is to use Facebook. Just search in the bar for your opt-in idea and observe the conversation that surrounds it. From there you can quickly understand exactly who your subscriber is. Use stories they can relate to. Consider their unique timezone and location. For even more important email personalization tips, check out this guide from Funnel Overload. How are you building trust with your email marketing? 4. Going easy on the marketing? People are on your list so you can sell to them (hint: email ‘marketing’), but is that all you ever do? One of the fastest ways to turn people off your brand is to sell sell sell all the time. This is especially important if you sell affiliate products via email. Are you pitching useful stuff or just the high ticket stuff? 6. Keeping it light with maybe a tinge of humor/inspiration/motivation? No, you aren’t a comedian but no one wants to open an email that doesn’t make them feel something. People are mostly ruled by their hearts, stand out among your competitors with a firm grip on your subscriber’s heart and they’ll open your emails first. Become a friend that shares entertaining, motivational, useful stuff. If you’ve worked so hard to create kickass lead magnets, an engaging welcome email series, personalized your content and got subscribers to actually open your emails, you don’t want to let it all go to waste now do you? While your subscribers would have come to love you by now, there’s no telling how fickle their loyalty is. To keep your love spark alive, email them often! I’m going to offer anecdotal advice here and say weekly but you may want to take a look at this infographic from CoSchedule to decide. Your schedule would depend on what type of blog you run and how often you have new information to share but whatever you do don’t let a month get by without emailing your list. And that is even after sending them an engaging welcome series. Stuck wondering what to email them so frequently? Try these tips. Plan your content so you have emails scheduled out in advance. Repurpose ideas from blog posts, videos, popular social media posts. Answer a frequently asked question from your subscribers. Emailing your list after a long period of absence can be tricky. You dread the sure unsubscribes, maybe a few spam reports but if you want to salvage your list at all, you must email them today. Craft great headlines (Answers “What do they have to say today?”) and keep testing! Getting open rates of 40% or higher is pretty easy when you do list building right. Once you attract the right people to your list, establish your brand recognition with your subscriber, cement your relationship with trust and never stand up your list and they’ll love you. It’s much like dating. So go date your list and blow those open rates out the water! Lily is a blog coach who helps overwhelmed bloggers find their unique selling point, streamline and automate their processes while still increasing and optimizing conversions. Her most personal blog is FindingBalance.Mom, a place where ambitious moms learn to smartly create online blog businesses that allow them "Have it all".